Scan Bidco A/S has today published the annual financial report 2018. The 2018 revenue was DKK 3.5 billion versus DKK 3.4 billion in 2017. The total Gross Profit was DKK 592 million and the Gross Margin equals 16.8% versus 14.9% in 2017. The 2018 EBITDA before special items comprise of DKK 89 million. 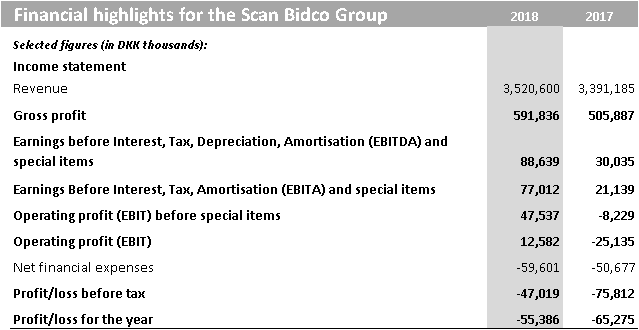 Scan Bidco A/S discloses the information contained in the annual report pursuant to the EU Market Abuse Regulation (596/2014/EU) and the Swedish Securities Market Act. The information was submitted for publication by the above mentioned persons at 21.25 (CET) on 15 April 2019.